Geboren 1962 in Esslingen, lebt seit 1992 in Köln. Theater-Regisseur und Künstler. Performativ bespielte Rauminstallationen. Ausstellungsrealisationen, Ausstellungsgestaltung und kuratorische Arbeit. Texte, Vorträge und Lehre zu Themen der zeitgenössischen Kunst. Künstlerische Projekträume Atelier LABOR und Atelier PRAXIS, beide in Köln. Seit November 2009 Mitglied bei SECHSTE DIREKTIVE – Theaterprojekte. is theatre director, action- and media artist. Born in 1962 in Esslingen near Stuttgart, Germany. Lives in Cologne. From 1984, Michael Staab has worked at several German theatres as actor and director. In addition to experimental stage productions, he has begun in 1992 to explore the development of “classical” performance art and happenings with regard to form and content. Staab`s projects are always related to the respective site and context and allow utmost direct interaction with the audience. Art is understood as a catalyst for social processes. He therefore calls his performative projects “interactions.” In his work Staab combines the traditional and modern forms of the visual and performing arts, music and literature, and connects them with audio-visual and digital media on a high artistic and aesthetic level. Another aspect of his working method is a collaboration with artists and experts of all fields in the sense of a multiple authorship. 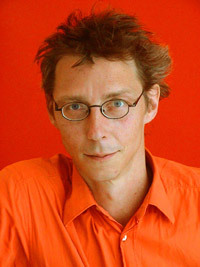 In 2001 he founded the “Michael Staab Time Creators Production”, that will be a international network of artists and specialists in performing arts and interdisciplinary art forms. Staab`s subject is man as social and individual being in the multi-media and multi-cultural society and the exploration of the complex organization structures of social life. This allows new ways of looking at familiar places, patterns of behaviour and ways of thinking and a reviewing of established structures with regard to their social interactions. The intention is that audience and participants can have access on the basis of their normal circumstances. The audience becomes an active part of the artistic action and the art work. All performances are documented on Video. This material then becomes part of autonomous artificial and artistic space and video installations. In connection with every action an edition of objects or prints is produced. Michael Staab has worked at important German theatres, for instance in Stuttgart, Esslingen, Freiburg, Braunschweig and Nürnberg. Since 1992 he is frequently invited to present his interdisciplinary projects and performances at festivals and cultural events. Museums, galleries and other art institutions realise his performances, project documentations and exhibition projects such as video and space installations. His work has been awarded several national and international grants, for instance the International Academy Solitude grant, 1996. In addition to his work as an artist, Michael Staab works as freelancing assistant curator, project manager and exhibition designer for national and international museums and art institutions. His interests are the development of new forms of the presentation of contemporary art. He regards the mediation of art as one of the tasks of his profession as an artist. This is also the reason why he regularly teaches drama students in improvisation techniques and new forms of performing art, does speeches and writes articles about themes of contemporary art. Regie bei Die unendliche Bibliothek. Stuttgart 1996.